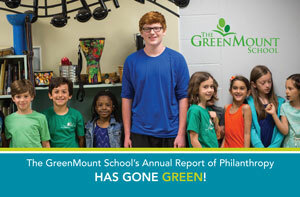 This Report of Philanthropy summarizes giving at The GreenMount School in the fiscal year 2016-2017. We are honored to express our gratitude to each member of our community who has contributed to the growth and bright future of The GreenMount School. Your contributions bring new experiences to students and ensure that more children can experience a GreenMount education. This GreenMount School Report of Philanthropy is published by the Development Office and designed by a GreenMount parent. We endeavor to be as accurate as possible in recognizing the generosity of the greater GreenMount community and deeply apologize for any errors or omissions. Thank you for your gift and support.